Attack controls how fast the Compressor and Limiter will attenuate loud signals, while Release controls the time it takes to stop attenuating after a loud signal ended. Low Release times can cause distortion at low frequencies. Gain sets the amount of gain applied after dynamics processing has been done. 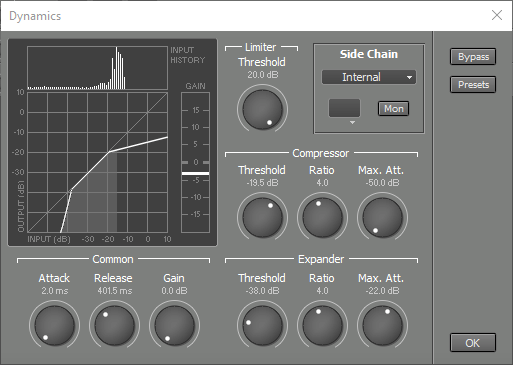 The Transfer Curve on the left shows the effect of the current settings of the Limiter Treshold knob, the Compressor/Expander Treshold, Ratio and Max.Att. (maximum attenuation) knobs and the Gain knob. The horizontal axis represents the input, the vertical axis represents the output. The vertical Gain Reduction meter shows the current amount of gain applied by the effect. The Level History (top left) shows the relative amount of time the input signal is at a certain level (the higher the bar, the more time). The Level History will be reset when either the Transport is started or the Dynamics window pops up. You can be reset it manually by pressing the F5 key (Windows) / Command-R (Mac).